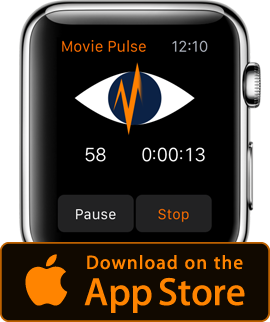 Recording your heart rate with Movie Pulse will no longer affect your activity rings! Finally! It has been tricky but simple at the end. Thanks to the users who urged me to focus on this . It has been a malfunction which Apple Watch users don’t like: mess their workouts and calories. One sentence as an excuse: Many apps faced this problem and even Cardiogram just recently removed it with an update. At second, records will now no longer be sent to the Watch multiple times. It has been thought as a security net, not to loose data, but … I implemented it the wrong way. Until now! Besides this, implementing Open Movie Database required an update to get access to their movie entries (for which I pay a monthly donation btw.) So, all users of Movie Pulse must update to version 1.5 to specify their recorded movies via OMDb! Otherwise the search for a movie title will fail. In case something else goes wrong, please leave a comment, send me a mail or use the bug report below. While I am writing this post, it seems the update has not only eliminated bugs: a new one arrived. The recorded heart rate will now and then be sampled at an unpredictable frequency, causing hilarious curves. I’m afraid version 1.5 is somehow useless at present. Sorry, but I will do further investigation.